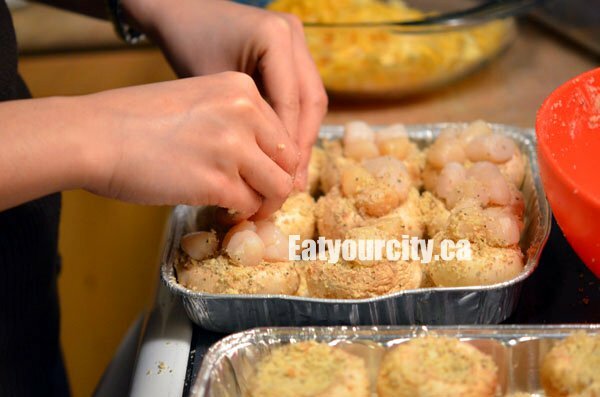 Eat Your City: Scallop stuffed mushrooms recipe - easy, cheese-y appetizers for any party! Scallop stuffed mushrooms recipe - easy, cheese-y appetizers for any party! Nestled into the baking pan and ready for the oven! ﻿﻿-1 cup shredded marble cheese: mozzarella showcased scallops flavor better, stronger flavoured cheeses like Gouda, cheddar, Swiss masked flavors, but whatever's in your fridge! Cheese is optional for those who don't like cheese, just omit. 2) Add in all the dry ingredients (Parmesan cheese, pepper, basil, oregano, granulated garlic) and mix well. Using a fork (I used my hands cuz it was easier), combine in the butter until the mixture is well mixed, crumbly and semi-holds together if you take a pinch and squeeze. 3) Line a baking sheet or pan with tin foil or parchment paper and grease sheet with olive oil. 4) Wiggle out and remove stems from mushroom caps - save the stems for later use in pasta. Pack the mushroom caps full of the seasoned bread stuffing - don't worry if you make a mess :) and plunk the mushrooms on the greased sheet/pan. 5) Top stuffed mushrooms with baby scallops and sprinkle with cheese (so they don't roll away while they cook in the oven). 6) Bake for in preheated 425F oven for 20min. Cool down before you toss back these molten yummy babies! 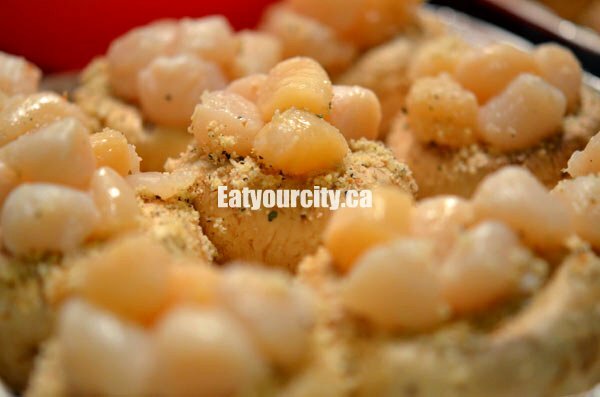 It is one of the best snack item of Scallop stuffed mushrooms among all the snack Recipes which are crunchy to have which likes by most of them. Urban China Edmonton, AB - Yummy dim sum!